Biolights, solar and rechargeable lights are a logical move for people who love the great outdoors, and who want to keep it that way. 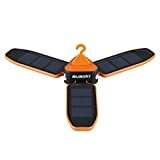 We’ve chosen some of the best solar and most eco-friendly rechargeable camping lights, which strike a balance between great value and great performance. Keep your solar light out during the day to charge, and enjoy free energy all night long. If you’re hiking, find a way to secure your lamp to your rucksack, and charge as you walk. 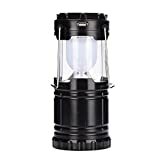 When what you’re looking for is maximum run time, this Solar and USB Rechargeable Camping Lantern is a great option. Unfussy, fold-out design exposes the solar panels for charging during the day, and once fully juiced up, the light has an operating time of up to 40 hours, depending on the light intensity level selected. 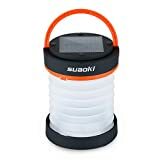 Small and powerful, this solar powered lantern is splash and rainproof, so ideal ideal for weekends away camping. Small and mighty, this lantern is great quality and folds up neatly to protect the solar panels on the inside. This Solar and USB Rechargeable Camping Lantern is made from high quality plastic, with a frosted dome front to help diffuse the light and make it more ambient. We’re particularly impressed by the frosted front, which spreads the considerable light evenly, so that it doesn’t hurt your eyes, or focus the light on any one spot. The whole thing is made from durable plastic. Another great contender in our review of best solar lanterns. There are two solar panels inside this lantern, which you’ll find by folding the thing open and laying it flat. Around 8 hours of charge will buy you up to 40 hours of light, if you use the light on its lowest setting. There’s a solid handle on top the lamp for hanging, and because it’s so compact, it travels well even in small rucksacks. Small and mighty, this lantern is great quality and folds up neatly to protect the solar panels on the inside.